Lac Vieux Desert, a 5,000-acre lake at the border of Wisconsin and Michigan. 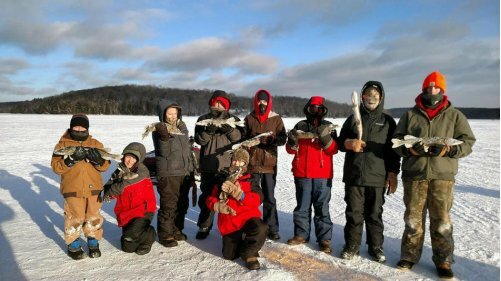 Sixteen Boy Scouts and four adult leaders from Troop 33, sponsored by First Lutheran Church in DeKalb, made a much-anticipated January trip for an ice fishing adventure. The troop arrived to cabins perched on a hill that overlooks Lac Vieux Desert, a 5,000-acre lake at the border of Wisconsin and Michigan. Scouts enjoyed an Italian dinner of pizza and lasagna, salads, soups and draft root beer. For the fishing day, professional guides volunteered to lead the boys onto the ice. Numerous tip-ups were set up to prepare for the day. There was a heated ice shack on the lake and a 28-foot wide wall to block the north winds. An outdoor fire pit kept scouts warm as the fish were biting throughout the day. Some boys were new to ice fishing and received a lesson in how tip-ups work and the types of fish they might catch. It wasn't long before the boys were pulling up Northern pike. They caught at least 30 pike throughout the day. Due to very cold temps and north winds, some time was spent by the fire and inside the ice shack warming cold hands and feet. But the cold didn't stop the fun. The scouts even enjoyed lunch on the lake. Their day started at -10 degrees and rose to a high temperature of -2 degrees, plus 15 mph winds. A total of nine Northern pike and one walleye ended up in the keeper pile. That night, the Scouts enjoyed a fish fry of their day's catch, sloppy joes and cheesy potatoes. A brand new tip-up was awarded to the scout who caught the largest fish of the day.